The global smart baggage handling system market will experience high demand in the forthcoming years, according to a Transparency Market Research (TMR) report. The market is moderately concentrated at present. High level of rivalry exists between the market players, who are keen to gain momentum in the smart baggage handling system market. Market competition is likely to accentuate with the entry of new, small-sized players in the coming years. Vendors in the smart baggage handling system market are leveraging innovative technologies with an aim to offer high quality products. Examples of these technologies include internet of things (IoT), cloud technology, machine-to-machine solutions, and others. Prominent players in the global smart baggage handling system market are Pteris Global Limited, Vanderlande Industries, Daifuku Web Siemens Group, Fives Group, and SITA. According to TMR’s projections, the global smart baggage handling system market was valued to be worth US$1,508.6 mn in 2016. The market is forecasted to rise at a stellar 19.4% CAGR over the forecast period from 2017 to 2025. 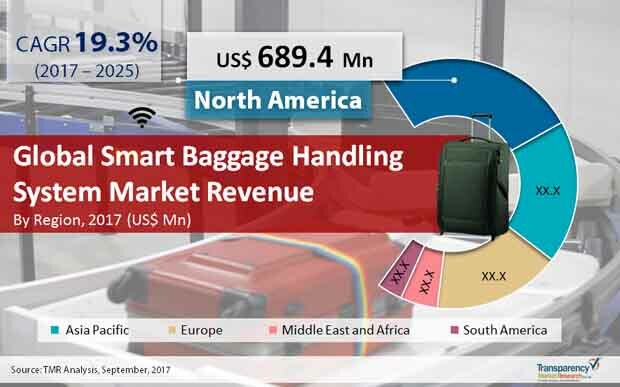 Considering this figure, the smart baggage handling system market is estimated to reach US$7,210.8 mn by 2025. In terms of segmentation based on the technology, radio-frequency identification (RFID) is anticipated to gain substantial market revenue over the forecast period. Geography-wise, the North America smart baggage handling system market is expected to emerge dominant. The region is expected to exhibit a robust 20.5% CAGR over the forecast period. The smart baggage handling systems have enhanced customer satisfaction for stakeholders. The smart baggage handling systems provide in real time data and turn-over times for the support teams at the airport. This solution is based on the basic concept of minimizing damage, misplacement and baggage retardation. As a result, the market for the smart baggage handling system is growing. A modernization of existing airports, growth in airports and air travelers and the increasing availability of people's revenues lead to high demand on the handling of baggage and baggage tracking system are some of the key drivers of growth in the world smart baggage system market. The increase in automation reflecting the increasing use of conveyor systems reduced baggage mismanagement in 2018 compared to 2017, according to the Société Internationale de Télécommunications Aéronautique, SITA. A growing volume of domestic and international passengers in the air and maritime sector has helped producers of baggage handling systems to find ways of improving existing baggage handling technologies with automated sorting. In the next couple of years the use of automation across various vertical systems, including this industry, should boost the world market for smart luggage handling systems. The growth of this market is being limited by factors such as complex architecture and high initial investment. However, an increase in the volume of passengers and cargo with a limited airport area offers market players new opportunities for growth. Furthermore, the Baggage Handling System Market is driven by the increasing focus on improving air connectivity and developing intermodal transport. The drivers of the market and CAGR will meet the market challenges in the coming years.